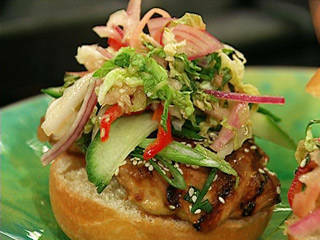 Kimchi Slaw is a wonderful topping for pork, burgers, or as a small side. Combine the cabbage, onion, garlic, pickled ginger and pepper in small container with a tight-fitting lid. Heat vinegar with hot sauce, water and sugar to dissolve the sugar. Pour over cabbage, cover and shake. Refrigerate a couple of hours, shaking the container occasionally.